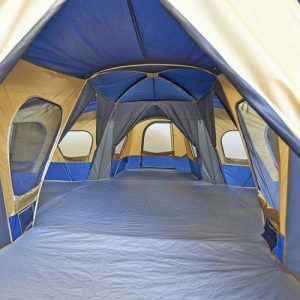 The Ozark Trail Base Camp 14-Person Cabin Tent is a very unique and affordable family camping tent option, with a 5 room design and height enough to easily stand fully up in. It’s available in blue and orange. Ozark Trail tents are manufactured with the economical tent buyer in mind. Most of their models are available under $200, including roomy 10-person cabin tents, while some smaller models are available under $100, and the giant 5-room 14-person Base Camp Cabin Tent can often be found under $300. 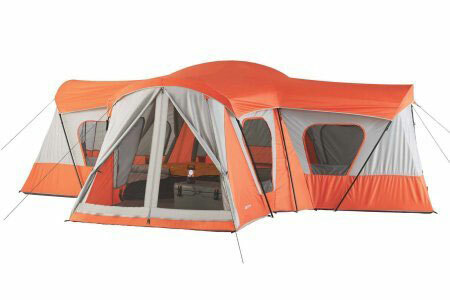 Those are very low prices for such large tents, while the quality of Ozark tents are generally mid-range. They are solidly in the middle, below Columbia and above Coleman essentially in price and quality. 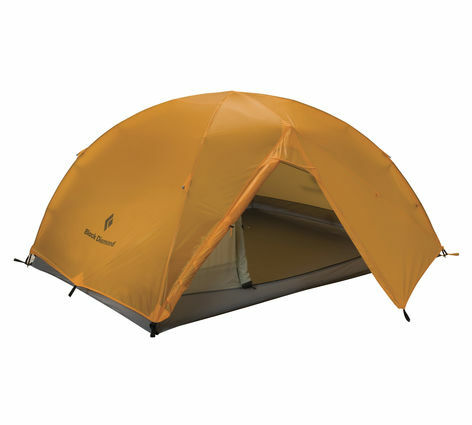 Ozark Trail tents are budget priced tents made by a number of manufacturers, and sold primarily by Wal-Mart. 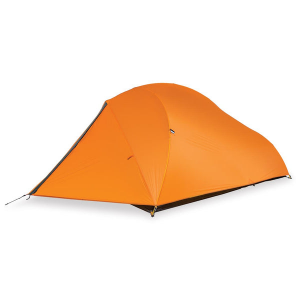 However, a good variety of Ozark Trail tents can also be found on Amazon. Ozark tents are designed to fit the needs of the occasional camper, or the camper who does not want to purchase an expensive top of the line tent. While the line of Ozark tents are not designed for those who wish to take month long camping trips or the year round camper, they are a viable solution for those who want to enjoy some time in the great outdoors camping and backpacking, or maybe just test the water to see if camping is an activity that they enjoy and may want to spend some more time doing in the future. 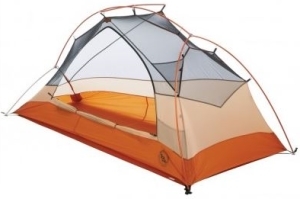 Below you will find a comparison of some of the top-rated Ozark Trail tents of 2019, followed by more detailed reviews of some of the most popular models. We hope the comparison table above was useful for quickly comparing the key features of top Ozark tent models. 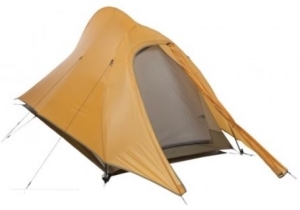 Below we will go into more depth of some of the most popular Ozark Trail tents. There aren’t many 14-person large family tents that are better than the Ozark Base Camp 14-Person Cabin Tent. Not only is it an extremely roomy 235 square feet of floor space, but that space is divided up into 5 wholly separate rooms in a unique plus design. 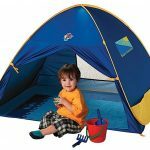 Plus, being an Ozark Trail tent, it is cheaper than even quite a few other smaller family tents from other brands. Depending on your family dynamic, the separate rooms can be useful for privacy when needed, and then the room dividers can be pulled aside during the day to reveal an extremely spacey interior. Each room is designed to fit a queen size bed. 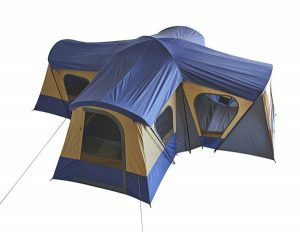 An ideal way to use this tent is to put a queen size air mattress in three of the side rooms, then leave the front of the tent open for a foyer, and the center room open for a living room. That’s a very comfortable way to sleep 6, and works great for couples camping together. Or if your family is larger you can fit up to 6 more sleepers in the center room at night, and simply stack their beds in the side rooms during the day to still have a living room. The footprint of this tent is 20′ x 20′, so make sure to get a camping spot that can fit an oversized tent that large. 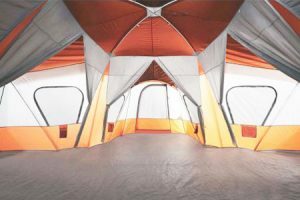 Even most tall people can stand comfortably in the center of this roomy tent, which reaches 6 feet 6 inches high. The side rooms are a bit lower, but are still fairly comfortable for standing most of the way up. 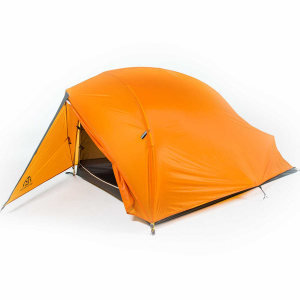 The Ozark Base Camp is available in both a Blue/Tan combination as well as a striking Orange/Gray combination. Ozark’s Dark Rest Instant Cabin is an interesting tent that also works great for families. It is called an “instant cabin” because the tent poles are actually pre-attached to the tent itself, meaning there isn’t really any assembly. 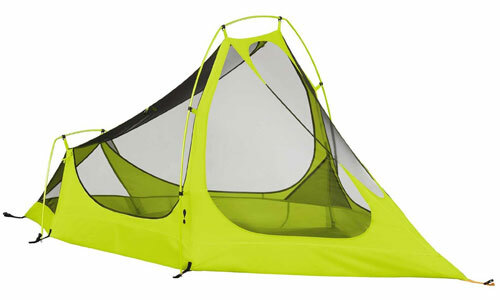 The tent just unfolds and extends up into shape, much like an easy-up canopy. 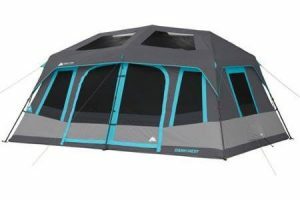 The other interesting part about this tent is it is almost entirely black and dark gray. They call it “Dark Rest” technology, and it is actually supposed to keep the tent cooler under direct sun by blocking sunlight. It can also keep the room quite a bit darker, which is useful for people who are sensitive to light when they sleep. Of course, there are multiple skylights you can easily open if you’d rather enjoy the stars or light up the tent during the day. Plus, the dark color just plain looks pretty cool with the light blue accent. This cabin tent also comes with a removable divider, so you can choose whether to have an open space or two separate rooms. While the tent can theoretically fit 10 people in sleeping bags, it can only fit 2 queen sized air mattresses. At 6 feet 6 inches high, it is also easy to stand in even for most tall men. As with any Ozark Trail tent, the quality is mid-range, so be sure to set up and inspect your tent once before bringing it out on your trip, so you have time to exchange it in case there are any defects. 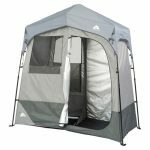 Not a sleeping tent, but still worth mentioning in a page about the best Ozark Trail tents, is this great Instant 2-Room Shower Tent that Ozark makes. It’s a highly regarded portable shower tent great for anybody who wants to turn their extended camping trips into more comfortable ones. The tent sets up instantly with pre-attached tent poles, more like putting up an easy-up than a traditional tent. It divides into two rooms via a zipped up divider, so you can use one room as the shower and still have a separate changing or utility room, or use that room for a portable toilet. If you leave the zipper undone you can have just one large room. The shower room itself comes with a 5-gallon solar shower bag and shower head. The solar shower heats up with a few minutes in the sun, and then you hang the shower bag up on the tent’s hook to take a shower. One of the few complaints with this portable shower tent is that the hook can struggle to hold up the 5-gallon bag when it is full of water, so there’s not really the ability to sub it out with a bigger bag. However, you can use other portable water heaters, such as a propane-based one, if you wanted and just thread that hose through a small hole you make. 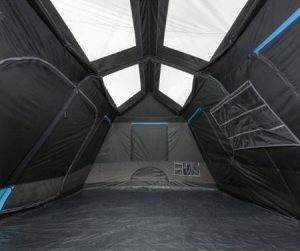 As for drainage, the floor of the shower tent connects to the body of the tent via a mesh section that the water drains out through. It’s not an open hole that bugs and animals can get through. 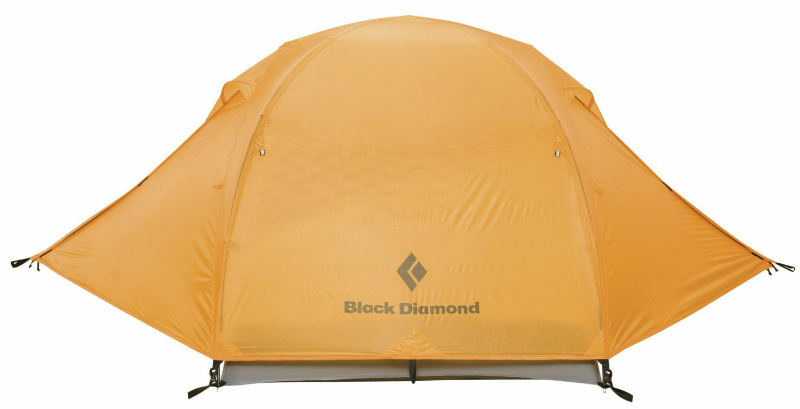 Overall, the Ozark 2-room shower tent is a well-designed portable shower. Although Ozark Trail Tents are made by several different companies, these tents all seem to be made with the same attention to detail and advantages or disadvantages regardless of tent size. So spending a few minutes noting those advantages and disadvantages may help you decide if an Ozark Trail tent is right for you and your family. There are many advantages to choosing an Ozark Trail tent, starting with the price. The cheapest Ozark Trail tents are under $30, while they have large family tents for under $100. The quality of the larger models that are that cheap can be suspect, so if you’re buying a family tent you may want to look for the tents more in the $100-$250 range. In addition, these tents are easy to set up which is a benefit for both those people who are new to tent camping and those who have camped before. When you consider the low price of these tents you would expect some disadvantages and surprisingly there are less than you might imagine. 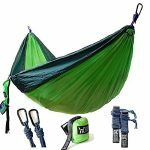 However, there is one major disadvantage that could pose a serious problem and that is that many users found the tent poles to be fragile and that they shatter easily. This will result in either needing to purchase replacement poles, which cost almost as much as some of the lower priced tents in this line, or rendering your Ozark tent unusable. Some users found that the stakes on the 12 by 10 tents holding the tent down to the ground break. Tents were sometimes too small to accommodate the number of people they said they were designed for. The rain flies can be too small to give adequate protection. While some people found that these Ozark tents provided great protection from the rain, others stated that the tent leaked. This could be due to the different manufacturers. Some tents may be better made to hold out rain than others. While Ozark Trail tents are not a tent that would be recommended for the avid camper, for those who only camp occasionally or for those who want to find out if camping is an activity they enjoy these tents are a good choice and a good value. Overall, an Ozark Trail tent is a reasonable quality tent that is made to last for several years, although fragile at times. There are some disadvantages to these tents most of which are easily correctable without costing a whole lot. However, considering the problems many people have experienced with the Ozark Tent poles, it could be wise to invest in higher quality tent poles to fit your tent as a backup if you plan on using it more than a few times, or invest in another tent brand.